Primary Industries and Regions South Australia (PIRSA) publishes a report on the condition of Crops and Pastures in South Australia every second month. During the cropping season estimates of the area and production for each crop and district are also provided with the report. The report is assembled by regionally based consultants. Visit Rural Solutions SA. The estimates are quality checked from a number of sources. Occasionally adjustments are made. The table in the current report has the updated estimates which may vary slightly from tables in previous year's reports on this site. Final production estimate for the 2018-19 crop season is 5.6 million tonnes from 3.5 million hectares, worth $1.9 billion at the farm gate. Crop performance varies greatly between districts: grain production above average in some southern districts while drought affected districts are well below average. Crops in some regions including the Eyre Peninsula harvested better than earlier production estimates. Lower Eyre Peninsula set a new record high for grain production. Paddock feed is low across the grain producing areas and feed and surface water shortages prevail in most of the pastoral district. Farmers continue hand-feeding reduced stock numbers or have destocked completely. Crop estimates for a season are provided commencing with the Seeding and Crop Establishment Report. 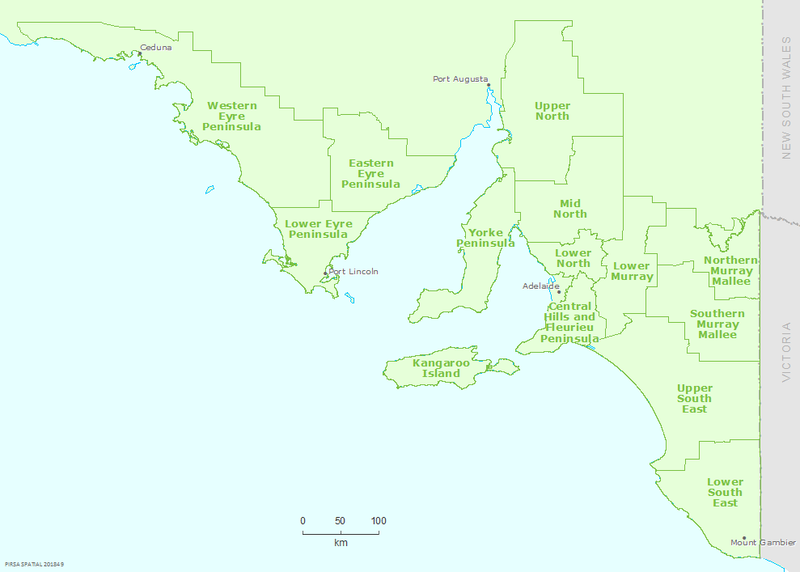 Estimates are based on the districts defined in the following map. See more agricultural reports and newsletters.